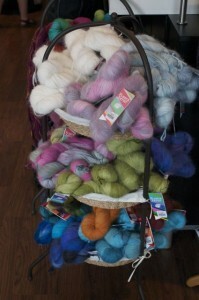 We just got in some beautiful new colours in the ever popular Peter Rabbit. This is an aptly named Angora yarn (70% Angora, 20% Nylon, 10% Wool) from Handmaiden. What might Angora be you ask? It’s bunny hair! 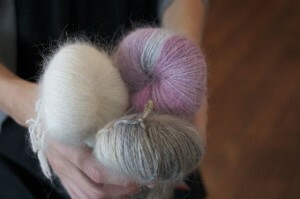 It is a super soft and charming fiber that is fuzzy (maybe hair is a better word for it) and oh so warm. Nothing traps heat like Angora, it’s even warmer than Alpaca. It always sort of reminds me of capelets or mitten cuffs someone might wear in the fifties or sixties. Perhaps a sweater set with a combination of angora and wool. Something you might see in a period movie anyway. That image sort of makes the yarn seem sophistacated but it’s also really fun. The fuzzy softness is perfect to add a bit of whimsy to any knit. A whole garment in Peter Rabbit might feel like a bit much (although I’m certainly not ruling it out) but I am thinking I will head in the accesories direction. 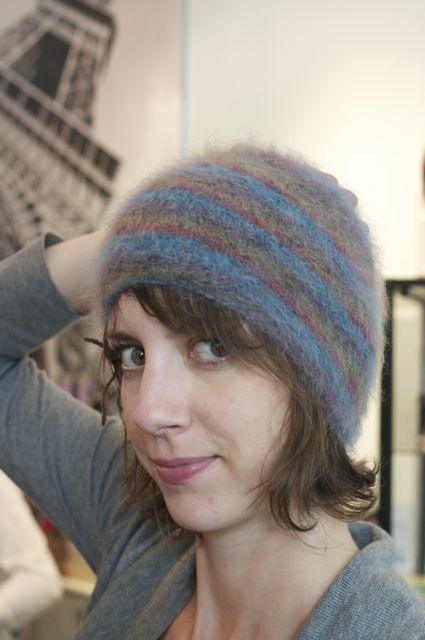 This little hat is so cute and fuzzy, it’s a free pattern with purchase of yarn. Whip one up this weekend! This entry was posted on Friday, September 24th, 2010 at 9:47 am	and is filed under Uncategorized. You can follow any responses to this entry through the RSS 2.0 feed. Both comments and pings are currently closed. Isn’t Peter Rabbit from Fleece Artist? I love and will be coming in on Saturday to get some! Oh Darcy, you are so right! Peter Rabbit IS from Fleece Artist!